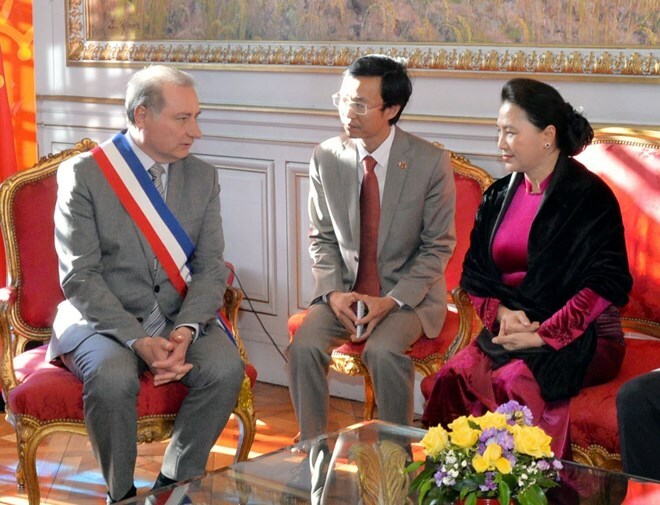 Toulouse (VNA) – National Assembly (NA) Chairwoman Nguyen Thi Kim Ngan met with Mayor of Toulouse city Jean-Luc Moudenc on April 2 (local time) on the occasion of her official visit to France. The Vietnamese legislative leader congratulated the city on the successful organisation of the 11th conference on cooperation between Vietnamese and French localities. The NA Chairwoman said Vietnam and France established strategic partnership in 2013 and marked the 45th founding anniversary of diplomatic ties in 2018. The number of students and tourists exchanged between the two countries is increasing, while Vietnamese national and private airlines have signed aircraft contracts with French partners, which are good signals illustrating the sound relations between the two countries, Ngan said. Mayor Jean-Luc Moudenc highlighted the cooperative ties between Toulouse and Hanoi, particularly those in the field of cultural heritage preservation since 1996 which have produced good outcomes. The two sides have been expanding collaboration in culture, tertiary education, and health care, he said, adding that the Vietnamese community in Toulouse has made significant contribution to the sound cooperation between the two cities. The mayor described Vietnamese people in Toulouse as a dynamic community and they are integrating well in the host society. The French city has maintained regular exchanges and meetings with the local Vietnamese community, especially on the occasion of traditional Lunar New Year (Tet), the most important holiday of Vietnamese people, he added. Chairwoman Ngan said the conference on cooperation between Vietnamese and French localities was a success, with a number of memoranda of understanding on cooperation signed at the closing ceremony. The Vietnamese top legislator shared that French leaders highly appreciated the decentralised cooperation mechanism between Vietnamese and French localities and hoped the two sides will continue promoting it.